ENGLEWOOD, Colo., Dec. 15, 2017 /PRNewswire/ -- For the past few holiday seasons, one controversial question continues to surface: is Die Hard a Christmas movie? Today, DISH is taking an official stance to help settle the debate. Yes, Die Hard is a Christmas movie, and in celebration of this fact, DISH is gifting customers access to this hotly-debated Christmas classic. In what the company has coined the "12 Days of Die Hard," customers can watch Die Hard on-demand beginning today through Tuesday, Dec. 26. Yippee-ki-yay, movie lovers. "Every December, Americans engage in the national online conversation about whether Die Hard is a Christmas movie," said Jay Roth, DISH CMO. "So this year, we went into the archives to look at historical TV viewership on DISH, and we're calling it: Die Hard is a Christmas movie." Last Christmas Eve, 1.3 million people watched Die Hard, with 2.4 million viewing the movie at some point during the holiday season. This number jumps to 4.3 million if you count Die Hard 2, which is also a Christmas movie. Die Hard was the 10th most-watched movie last Christmas Eve, meaning that more Americans watched Die Hard than holiday-favorites, Miracle on 34th Street, Home Alone and The Santa Clause. DISH first helped to fuel this seasonal pop culture debate with the November 2017 release of its TV spot, "Santa." In the spot, Santa Claus uses DISH's new voice remote to quickly find his favorite Christmas movie, Die Hard. The new DISH voice remote interprets natural language to generate and select content, and is available to all new Hopper customers at no additional cost. 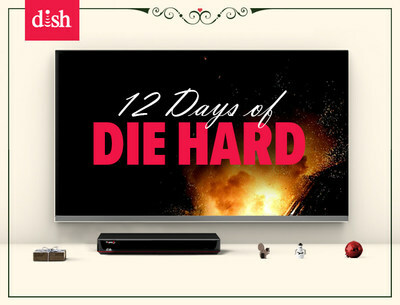 The "12 Days of Die Hard" runs on DISH from Dec.15-26. To access the Die Hard VOD, an Internet-connected set-top box is required. For additional information on Die Hard viewership during the holiday season, visit The DIG blog.